Owner’s manual from C.N. Structures in French. 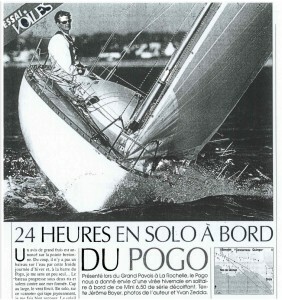 Article from Voiles et Voiliers number 316 June 1997. Some other manuals. Note: more recent manuals are available on the NKE website. Niclas, could it be possible to add one space to share our soutions, resources, second hand spares market? I have a questions, Did anybody knows if the metal pieces for the rudder are the same in the of Pogo I than the pogo 2? And the same for the mast rigging. Another tip, I’m be interested in NKE Displays, DL18, Performance or Girographic. Best regards and have a nice wind! I’ve got NKE manuals (a little bit old, before the dl18, performance or Gyrpgraphic screens) in PDF (english and french), do you want it to put in this area? Hi, yes, please send them to hello@pogo650.com and we can add them. Thanks! The mark of the mast use to be Z-Spars, and they sell this ring through distributors. About the front pulpit, if you look the resources, you can fit the Pogo 2 system. I sent to the administrator the complete info from this with all the spares and pics made by structures, to increase the information of our boats. 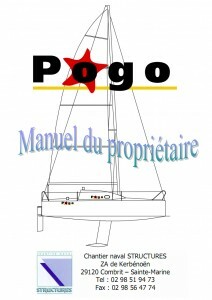 By other side, few time ago, some one, was selling the Pogo 1 pulpit in the Official web of Minitransat. On sale some NKE spares, see the link below. Anyone know where to find the logos of Pogo and Structures? Has someone changed to mast sliders? I was wondering if anyone has any plans of a road trailer with a tilt/canting rack. I am trying to get a trailer manufacturer to build one for my Pogo 1, but he asked me to send him the dimensions of the tilt rack. If any of you has such a trailer, which would allow me to transport the boat without any legal problems across Europe, I kindly ask you to send me the dimensions of the rack for the manufacturer. Or even better, if you know someone willing to sell such a trailer, please let me know asap.